Phoenix Art Museum presents the first ever Museum retrospective to highlight the extraordinary ingenuity of American designer Giorgio di Sant’ Angelo. 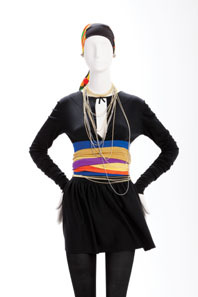 The winner of two Coty Awards and two Council of Fashion Designers of America honors, Sant’ Angelo’s notable three-decade career generated a wide array of collections, including Gypsy (1969) andNatives of the Americas (1970), all of which were innovative for their pioneering use of stretch fabrics and powerful expression of the era. 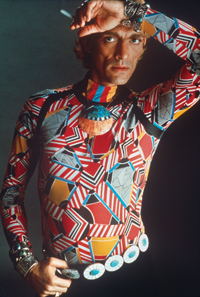 Featuring more than 40 ensembles and accessories, the exhibition spans the late 1960s through the early 1990s and provides a stunning overview of Sant’ Angelo’s influence and legacy. image credit:Barbara Carrera and Giorgio di Sant’Angelo, 1968. Courtesy of Martin Price. This entry was posted in Exhibition and tagged Giorgio di Sant’ Angelo, Phoenix Art Museum. Bookmark the permalink. Was very happy to see this post. I adored his designs and still have an indian inspired knit pants outfit (not strech though) by him. Wish there were more photos of his creations.